SA Sports Empire Terminator Recon Crossbow Package - 613 The exciting NEW Empire Terminator Recon is the highest quality, most full featured crossbow offered at the best value in the industry - period. No other crossbow can compare to the Terminator Recon for performance power and adjustability. 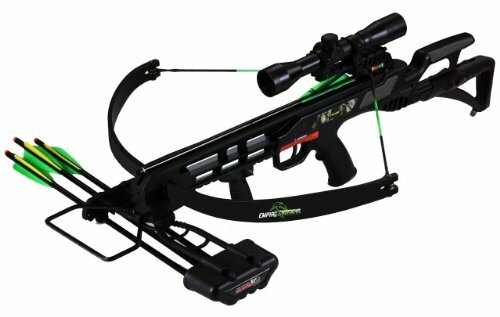 Experience the outdoors properly equipped with the Empire Terminator Recon Crossbow Package from SA Sports. Innovative Quality Design SA Sports was founded in 2010 with the hopes of becoming an influential presence in the outdoor sports world. SA Sports has grown since then and now supplies consumers with affordable gear without compromising quality. SA Sports works closely day in and day out with its designers and engineers to make sure its customers have the most up to date equipment at the most affordable price. Innovation and quality is what SA Sports strives for. Gull Wing recurve design for a powerful 260FPS shot; 175 lb. draw weight. Takes 18 to 22-inch arrows. Three arrows included. Includes 4x32 Multi-Range crossbow scope, to mount on its built-in full barrel Picatinny rail. Arrives pre-strung and ready to rock, right out of the box!